Dinnerware Saucers are important for fine dining restaurants when serving coffee. They come in china and glass to go under your hot drinks to catch spills and keep your table cloths clean. You serve dinnerware tea cups on top of these saucers to prevent spills on your tabletop. World Tableware Endurance Undecorated Saucer - 5 in. World Tableware Rolled Edge Undecorated Porcelana Saucer - 5.5 in. World Tableware Kingsmen Undecorated White Saucer - 5.5 in. World Tableware Desert Sand Ultima Saucer - 6 in. World Tableware Princess Undecorated White Saucer - 6 in. Argyle Saucer White - 6 in. Buffalo Bright White Saucer - 6 in. Wholesale Dinnerware Saucers from the Restaurant Supply superstore make your tabletop settings perfect and elegant for your restaurant patrons. 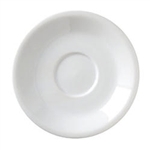 Our dinnerware china Saucers are dishwasher safe and durable to save your foodservice establishment money. If you run a fine hotel or restaurant, china or glass saucers will impress your guests and make your dining room look like a million bucks. Dinnerware Saucers for restaurants and other foodservice operations including china Saucers and glass Saucers.